It was the year Americans began to be sales pitched on the idea of using home test kits to identify gene derived maladies. It was a year when biologists continued to point in all directions, claiming there are 300 theories of why humans age and they still don’t have any idea which one is correct. It was the year when the promise of a red wine resveratrol anti-aging pill was “short lived.” But did this pill fizzle, or was it being swept under the rug? It was the year of the downfall of the Sirtuin1 gene as the “holy grail” of anti-aging. It was the year telomeres — those end caps on chromosomes — intrigued many and early adaptors excitedly searched for telomere lengthening agents — yet telomeres may just be another misdirection. Maybe longevity seekers ought to be looking at molecules that prevent double-strand DNA breaks rather than telomere lengtheners. It was a year where mTOR inhibitor drugs (whatever they are) began to be mentioned in place of resveratrol as an anti-aging pill. Yet the mTOR inhibitor drug rapamycin is fraught with side effects and could never be used in a healthy population. It was a year when microRNA began to be recognized as the predominant way our genes are switched on and off. It was a year when funding for anti-aging technologies began to dry up and the prospect of an anti-aging pill began to fade. This review of breakthroughs in anti-aging technologies will focus on the past year’s published scientific reports as well as developments outside science. This report is intentionally written to provide outspoken opinion and critical analysis of efforts to prolong human life since the public and scientific researchers themselves are often misdirected in their pursuit of longevity. Having written an annual report on the state of anti-aging advances for the past 5 years, I can say that that this field of scientific investigation becomes more perplexing with events outside the laboratory sometimes dominating over true scientific advancement. When executives at a pharmaceutical company began to sell a widely promoted longevity drug (resveratrol) as a look-alike dietary supplement via a non-profit side venture, eyebrows were raised and the parent company in Britain quickly stopped distribution of these pills, declaring the dry-powder nutriceutical version sold online by the Healthy Lifespan Institute wasn’t the same as the liquid drug version (SRT501). Overseas executives then promptly declared there would be no further development of a drug the world was holding its breath for. The company would pursue other patentable molecules for the treatment of disease, not to conquer aging. Those other patentable molecules appear to have fizzled also. Frankly, with this action Big Pharma abandoned an effort which, if successful, would have put itself out of business. Conquer aging and there is little need for a myriad of pills to treat every age-related disease. Did Big Pharma pay $720 million just to get this pill off the market? It appears so. Yet the thought of this never seemed to dawn on anyone. A great way to extort the drug companies is to develop a pill that would prolong human life and force them to buy you out for hundreds of millions of dollars to keep it off the market. Did the world’s only credible effort to bring an anti-aging pill to fruition get thrown out the window with the abandonment of SRT501? Keep reading. The bigger question was whether anyone was left to carry the torch for an anti-aging pill? It appears the baton has been passed to nutriceutical manufacturers. At the writing of this report there were 510 published resveratrol studies listed by the National Library of Medicine in 2010, with over 95% involving research-grade resveratrol (preserved in a frozen and sealed vial), which is not equivalent to what is being sold in retail stores in dosage, purity, or proven effectiveness. Only a few studies of branded resveratrol supplements have been published. Among over 290 brands of resveratrol pills on the market, only one company, Longevinex®, has sponsored ten ground-breaking studies with the remaining 290 brands producing just 3 studies, two of which failed to produce a positive outcome. 2008: Longevinex® reduces inflammation and oxidation better than green tea. Appalachian State University 2010: Pure Encapsulations 40 mg resveratrol reduced markers of inflammation and oxidation in humans. 2009: Longevinex® activates sluggish white blood cells and inhibits sticky blood platelets in 30 minutes. Nutriscreen, Covina, California 2010: Transmax (Biotivia) 4000 mg induced diarrhea in 6 of 8 subjects; indication of emodin content. A report I wrote earlier this year revealed this isn’t the first time biologists and commercial interests have chosen to back away from the development of a pill that could result in humans living longer than ever imagined. The discovery in the 1970s that genes can be switched on and off by small molecules which could produce an anti-aging pill was summarily swept under the rug when the life insurance industry realized people would delay their purchase of policies if they were to live significantly longer. With population control efforts in full swing (birth control pills) at the time, Time magazine tipped its hand by saying “we have birth control but not age control” Covert population control was the hidden agenda. The elites of the world chose to forego further research on an anti-aging pill even though they had discovered a small natural molecule, likened to resveratrol, that switched genes in the animal lab in the 1970s. Gene testing was in the news this year. Yet it was disingenuous for testing companies and the news media not to reveal these tests only address the 2-percent of disease that is inheritable via gene mutations. A vestige in biology that needs to be shed is Darwinian biology. Biologists are clinging to an outdated model that has already been disproved. The reason why this is important is because the Darwinian or gene mutation model of biology is hindering progress in understanding what causes humans to age. In 1995, the late Richard C Strohman, then emeritus professor of molecular and cell biology at the University of California, Berkeley, wrote of the impossibility of Darwinian biology in explaining human aging and disease. Strohman noted that disease tends to be geographic rather inherited, and as people travel or migrate, diseases change, which suggests the diet and environment influence genes more so than inheritance. The genetic answer to chronic age-related disease, which predominates in long-living populations, is encoded in the epigenome involved in receiving signals from environmental factors such as food, food deprivation, solar radiation and temperature. A single mutation does not predict disease because there are duplicate genes. Nature has back-up systems. If one gene is mutated, a duplicate gene would often function in its place. The discovery of epigenetics – the realization that the protein-making machinery of genes could be switched on and off (expressed or silenced, as geneticists say it) – revolutionized the modern understanding of man’s biological fate, but it wasn’t a welcome discovery. Darwinian biology prevailed and the mistaken idea that the sequencing of human genes was cast in stone by our forefathers left humanity to accept its fate. The prevailing dogma was that humans would live long or short lives dependent upon the inheritance of genes from their fathers and mothers. Changes in the sequence of nucleotides on the DNA ladder were forever. This mistaken idea was corrected in the January 18, 2010 edition of Time Magazine, with a cover story that was titled: “Why your DNA isn’t your destiny.” The public was, for the first time, being briefed on the science of epigenetics. Even still today biologists themselves continue to plug in the archaic Darwinian model into an epigenetic world and the public has Darwinian fate indelibly etched into their memory. This is in spite of the fact that Darwin himself, on two successive 2-month visits to the Galapagos Islands in the mid-1800s, could not have observed changes in the shape of bird beaks emanating from gene mutations over such a short period of time, since these mutations take many generations to occur. It is obvious what Darwin saw was epigenetic adaptation and variation. Biologists are still struggling to integrate epigenetics (gene switching) with genomics (gene mutations). They do concede that “progress in evolutionary genetics of aging has largely stalled.” Biology is talking out of two sides of its mouth. On one hand, it is widely documented that variations (polymorphisms) in human genes account for very little of the variance in lifespan. Yet that is often not the public face biologists put forward when they speak about human aging. Twin studies show that longevity in humans is only moderately inheritable> “with a genetic component of 25-32%.” Aging researchers know there are striking differences between identical (monozygotic) twins whose DNA sequencing is the same. There is also evidence that epigenetics can over-ride the effects of gene mutations, something that is not even considered. In 1947 researchers demonstrated that vitamin A altered the expression of genes in mice who typically exhibit thick wrinkled skin and loss of hair coat due to having two copies of a gene for a single trait (known as a homozygous trait). The provision of vitamin A reversed these changes, producing less wrinkled skin. This was an early example of epigenetics overriding an inherited trait. Research like this was obviously overlooked in favor of the ideathat inherited genetic traits were permanent. Some researchers say they know that “the biological reasons for ageing are no longer an unsolved problem in biology.” They recognize that the discovery of single-gene mutations can extend the lifespan of animals only in the laboratory. For example, several mice strains with defective growth hormone pathways experience an extended lifespan. The main point here is that aging researchers are talking about natural molecules, not man-made drugs. This makes perfect sense since nutrients are consumed in the daily diet and favorably or unfavorably switch genes. And it is something specifically within food — namely minerals — that largely control aging genes. The year 2010 was also the year of the demise of the Sirtuin1 gene. Once declared the “holy grail of aging” by a Harvard professor on the front page of The New York Times, geneticists now realize Sirtuin1 can both be up- or down-regulated with advancing age. So it cannot possibly be utilized as a marker of aging. Researchers at MIT, who had previously reported that the Sirtuin1 gene was up-regulated by a calorie-restricted diet, known as an unequivocal intervention that prolongs the life of all living organisms, reported that a limited calorie diet does not consistently up-regulate Sirtuin1 in all tissues and organs. Furthermore, the now common practice of adding an additional gene to living organisms in the laboratory (what are called transgenic manipulations, such as adding an antioxidant gene), may prove nothing and does not consider there are a large number of genes that are involved in aging. In their own words, biologists now say: “There are single genes that cause premature ageing, but no single genes in humans have been reported so far that significantly increase longevity.” Gene mutations can take away but not necessarily add years to life. The gene target was too narrow. In hindsight, the pursuit of a single gene target such as Sirtuin 1 appears to be a glaring misdirection on the road to longevity. Aging involves networks of genes, not a single master gene. Furthermore, it is unlikely a single molecule, whether it a drug or nutriceutical be, can control aging. That smudges all the current efforts now underway to develop such an anti-aging drug in the laboratory, since they are all based upon single-molecule approaches. It is better to study what promotes longevity than what causes humans to age prematurely. It is better to look at the whole rather than the parts. Some time ago researchers reported that a calorie restricted diet, which unarguably prolongs life, activates 832 genes in rodent heart tissue. That should dispel the single gene approach to understand aging. So far, the closest biologists have come to that model is a pill that was found to switch 677 of these 832 genes in the same direction as calorie restriction. Of course, that discovery has been summarily ignored by biologists! The biologists who conducted this experiment won’t even lecture on their own discovery! An early study in 2003 pointed to resveratrol, a red wine molecule, as a primary stimulator of Sirtuin1. But subsequent studies showed Sirtuin1 was stimulated by a fluorescent dye used in the gene analysis test. Furthermore, this past year researchers reported the perplexing fact that manipulations that either increase or decrease Sirtuin1 activity are both associated with a beneficial effect in animal models of ageing-associated disorders. So how can Sirtuin1 be used as a marker of anything? Yet idiotic nutriceutical companies continue to trumpet their products as Sirtuin1 activators. It’s a public charade with the blind leading the blind. Many theories, but what causes aging? For those who truly pursue longevity it is best not to fall into the trap of listening to everything that biologists say since their rhetoric often runs in circles. The field of anti-aging research often appears to take two steps forward followed by three steps back. He or she is likely to answer there are more than 300 theories of aging. Despite other researchers who claim the mysteries of aging have been solved, the prevailing consensus is that there is no consensus, that “the mysteries that control human lifespan are yet to be unraveled.” Theories abound, the antioxidant theory, the hormone theory, telomere theory, wear-and-tear theory. Yet all of these fall under the umbrella of the over-mineralization theory of aging, to be explained in more detail below. A biologist recently asked these questions, but had no answers for them. Why do we age? When do we start aging? What is the aging marker? Is there a limit to how old we can grow? Humans age because we begin to over-mineralize once full childhood growth is achieved for males and once menopause and baby-making is completed for females. During the growing years humans are having birthdays but not aging. There is no cellular evidence of aging during the growth years, such as accumulation of cellular debris (lipofuscin). Lipofuscin is the earliest sign of aging. Theoretically, there would be no limit to the length of human life if over-mineralization can be slowed, reversed or avoided. Why females outlive males. Females control iron and copper via monthly menstrual flow while males begin accumulation 1 excess milligram of iron per day of life after full childhood growth is achieved. By age 40 males have four times as much calcium and twice as much iron as an equally-aged female and have double the risk for diabetes, cancer and heart disease. Explains why aging, as evidenced by the appearance of cellular debris, begins with the cessation of childhood growth. Iron, copper and calcium accumulate within cells resulting in dysfunction of cell cleansing mechanisms (lysosomes). The accumulation of cellular debris (lipofuscin) generates free radicals and induces gene mutations and switches genes. Explains why vegetarians may tend to live a bit longer than carnivores. Vegetarians consume less iron. Explains why the rate of aging accelerates in mid-life. Iron accumulates progressively in midlife. Explains why there is a leveling off of the rate of aging in late life. A steady-state of iron is reached in late life, evidenced by a leveling off of iron storage (ferritin). For references to the above statements readers may wish to refer to the free online report entitled The Over-mineralization Theory of Aging, located here. In further support of the over-mineralization theory of aging, it is interesting to note that hemoglobin, which is an iron-carrying molecule, generally decreases as men age. One study of 3507 men found hemoglobin levels below 14 grams per deciliter of blood in 14.8% of men age 71-75 years versus 53.6% in those aged 86 years and older. However, in this group of 3507 men, 47 developed Parkinson’s disease over a period of nearly a decade and their hemoglobin rose significantly. An increased hemoglobin level in late life is associated with the onset of Parkinson’s disease. Eugene Weinberg, a noted authority on iron and health, says cells accumulate iron as they age. The iron content of some cells in the human body increases by as much as ten fold as they age. In aging rats, a 23% increase in iron content of gastrocnemius muscle increases oxidative damage by 85%. In a human study of 10,714 US adults, 2.3% had high iron transferrin saturation levels and in the subsequent 22 years of their lives their rate of death rose more rapidly compared to others with lower iron transferrin levels (transferrin is the iron transport protein made in the liver). In another study of 9229 people age 35-70 years who were followed for 12 years, individuals with both elevated iron and high dietary iron intake died more rapidly than with just one of the raised factors. Aging is accompanied by the accumulation of cellular debris called lipofuscin within cells. Lipofuscin is toxic to cells because it can incorporate metals such as copper and iron, resulting in cell death. Such increasing toxicity is extensive in aging cells. A hidden fact is that all the current technologies being explored to prolong the human lifespan control iron. In fact, iron switches genes. In an animal study, the provision of iron in the diet increased theproduction of an iron-controlling peptide (hepcidin) by 6.25 fold. Iron regulates various genes including those involved in progressive aging. In monkeys, a calorie-restricted diet has been found to decrease iron accumulation in the brain and preserve motor function. Calorie-restriction limits iron-induced cell damage. The provision of lipoic acid and carnitine has been proposed as an anti-aging strategy by noted biologist Bruce Ames. In fact, Bruce Ames was probably the first to propose a scientifically valid anti-aging pill by combining these two nutrients into a dietary supplement. It is not surprising to learn these two antioxidants reduce iron-induced oxidation. Metformin, a commonly prescribed anti-diabetic drug, is posed as an anti-aging pill. Yet it often goes unsaid that metformin reduces body stores of iron, and this may be its main mechanism for prolonging life. Metformin also restores ovulations in patients with premature menopause associated with polycystic ovary syndrome. Ovulation would resume monthly loss of iron and copper and reinstate the advantage females have over males in controlling accumulation of metals. The mTOR inhibiting drug rapamycin (Sirolimus) is now widely talked about as the next anti-aging pill. Again, it is no surprise to find that iron deficiency down-regulates mTOR (mammalian target of rapamycin). Also, iron chelating drugs inhibit mTOR. In fact, iron deficiency anemia is a known adverse effect of rapamycin (sirolimus) therapy. The first calorie restriction mimetic, proposed over a dozen years ago, was 2-deoxyglucose (2DG), a non-metabolizable form of glucose. 2DG has been found to reduce impairment of glucose and neurotransmitters induced by the provision of iron in rodents. The amino acid taurine was first proposed as an anti-aging pill when it was found that it was among the top five dietary factors associated with lower mortality in Japanese adults. Taurine reduces oxidative stress in the brain by virtue of its ability to inhibit metal-induced oxidation that degrades dopamine, an important brain chemical. Taurine also reduces oxidation in heart tissues induced by the provision of iron. 2010 was also a year of great interest in telomeres, which may be another misdirection in quest for an anti-aging pill. Telomeres are end caps on chromosomes. Telomeres shorten with advancing age. The association between telomere length and mortality is poor.However, the telomere story is so captivating that it has a life of its own. Attempts to develop telomere-elongating treatments may be misdirected but are also popular. Researchers say, although telomere length is implicated in cellular aging, evidence that telomere length is a biomarker of aging in humans is equivocal rather than conclusive. Another drawback of telomere biology is that telomere length is often averaged. But it is the shortest, not the average length of telomeres that are potentially deleterious. Furthermore, it is still unknown whether telomere length may result in increased lifespan on one hand and higher risk for tumors on the other. Telomere length is also controlled in part by iron. One study shows individuals who took iron supplements had shorter telomeres compared to non-supplement users. In another study, those subjects with shorter telomeres and less healthy lifestyles had a significantly increased risk of the presence of coronary artery calcification. Overmineralization of tissues again appears to be involved if not causal in telomere shortening. Probably what longevity seekers ought to pursue are molecular approaches to thwart double-strand DNA breaks rather than telomere lengtheners. Researchers propose that double-strand DNA breaks, being the most toxic and difficult to repair, result in accelerated aging Biologists indicate DNA double-strand breaks are the most dangerous of DNA lesions. They may lead to massive loss of genetic information and cell death. Inexact DNA repair may lead to premature aging. Mice that are genetically engineered so their Ku80 protein is deleted are found to prematurely age. Ku80 protein is required for DNA repair. Mean telomere length appears to decrease with increasing longevity, although not significantly, while levels of Ku80 protein, which is required for repair of double-strand DNA breaks, varies dramatically in species of animals and Ku80 levels strongly correlated with longevity. It is interesting to note that among centenarians, fibroblasts, cells that make connective tissue, were found to be less vulnerable to hydrogen-peroxide generated damage. The integrity of DNA appears to be greater among centenarians. Intracellular iron (iron that resides within cells) is a prominent source of oxidative stress within cells that leads to double-strand DNA breaks. In the year 2000 it was discovered that an iron-chelating (key-lay-ting) inositol hexaphosphate (IP6), a dietary molecule commonly provided in bran, is necessary for the repair of double-strand DNA breaks. Such a discovery should have alerted researchers on aging to the importance of this molecule. Small molecules called flavonoids, especially those found in red apple peel and red onion (quercetin), and in citrus peel (diosmin), red grapes and green tea leaves (catechin), which are the best known, bind to iron and protect against DNA damage. Many longevity seekers were drawn into efforts to prolong life via resveratrol pills, telomere lengtheners, stem cell activators, by the advent of epigenetic medicine. Epigenetics refers to protein-making by genes (switching genes on, or what is called gene expression, or switching genes off, what is called gene silencing) that are not changes in the sequences on the DNA ladder, which are referred to as gene mutations. The initial epigenetic mechanisms described were small molecules that can pass through cell walls and enter genetic machinery, either by adding methyl groups or influencing wrapping of strings of DNA around structures called histone bodies. However, in the past decade a greater understanding of epigenetics has led researchers to now recognize that microRNA are the “guiding hands of the genome.” MicroRNA are small snippets of messenger RNA that exit the cell nucleus and mesh with longer strands of messenger RNA. As microRNA mesh with messenger RNA, they shut off that segment of RNA that is assembling proteins, thus switching off genes. Longevity seekers should stay alert for studies involving microRNA and aging. The activation of microRNA change with advancing age and can act as both pro- and anti-longevity regulators. The first microRNA analysis of a commercially available resveratrol pill was recently published. The results were quite astounding. Resveratrol, and even more so a combination of other small molecules with resveratrol (Longevinex®), was able to restore a near-normal microRNA profile to rodent heart tissue if treated prior to a heart attack. Longevinex® exerted a far greater influence over microRNA than plain resveratrol. Longevinex® exceeded the effect of resveratrol in 15 of the top 25 miRNAs that were measured. How far away is humanity from a confirmed anti-aging pill? Mikhail Blagosklonny of Ordway Research Institute in Albany, New York, says “the discovery of anti-aging drugs is no longer a fantasy.” While validation of an anti-aging pill is said to require a lifetime, he believes an anti-aging pill could be validated in just two years if it were used for one common age-related malady and then monitored to see if it resolved other age-related diseases in the same group of patients. He suggests drugs like rapamycin and/or resveratrol as the most promising. These breakthroughs come none too soon as the International Monetary Fund issued a grim warning that “the Malthusian nightmare is approaching” as nations begin to face the cost of caring for aging populations. In developed nations the future tab for caring for aging societies is 10 times greater than the tab for the current financial crisis that now grips the world. A recent report claims there are 10 million people now alive in Great Britain who will live to 100 years of age, and that’s WITHOUT an anti-aging pill. Most certainly, an anti-aging pill will have to improve the health span and the lifespan of centenarians. Whatever anti-aging technologies are being developed had better be cheap, not only to consumers but in their development. 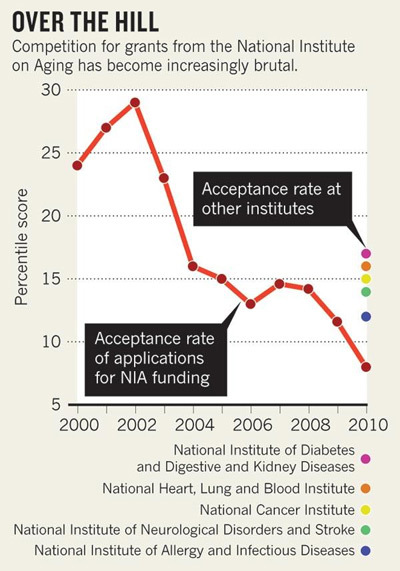 Predictably, funding for ageing research is being drastically reduced. Karen Duff, a researcher at Columbia University in New York says “we are cutting back on the very research that we need to keep our ageing population healthy.” Today researchers who submit a grant application to the National Institutes on Aging face about an 8% chances of winning funding. This is prior to soon-to-be-implemented austerity measures in healthcare. It is important for longevity seekers to realize there is a great deal of bamboozling going on in the anti-aging field, and it isn’t solely being distributed by online hucksters, but rather it comes from the scientific community itself. I have made an attempt to show that efforts to covertly hide the development of an anti-aging pill from the public go back over 35 years. Maybe efforts to hide an anti-aging pill are rooted in population control, but the delay in delivering such a pill is better explained by what is expedient for life insurance and pharmaceutical companies. Recognize just one natural molecule, resveratrol, exerts biological action as an antidepressant, anti-inflammatory, anti-bacterial, anti-viral, anti-fungal, anti-cholesterol, anti-cancer agent. It would replace most drugs in a modern pharmacy. An anti-aging pill, if they will ever allow one, is years away. You need to make a decision, based upon the best available evidence, as to whether this dream pill is actually within reach today. #### © 2010 Bill Sardi, Not for posting on other websites.